Explore voting rights as you investigate, Rockwell’s freedom of speech. Rockwell was inspired to paint this scene after attending a town hall meeting. In the meeting a manual laborer stood up and voiced an opinion that everyone disagreed with. Rockwell was struck by the fact that no one shouted him down even though he did not agree with the majority. 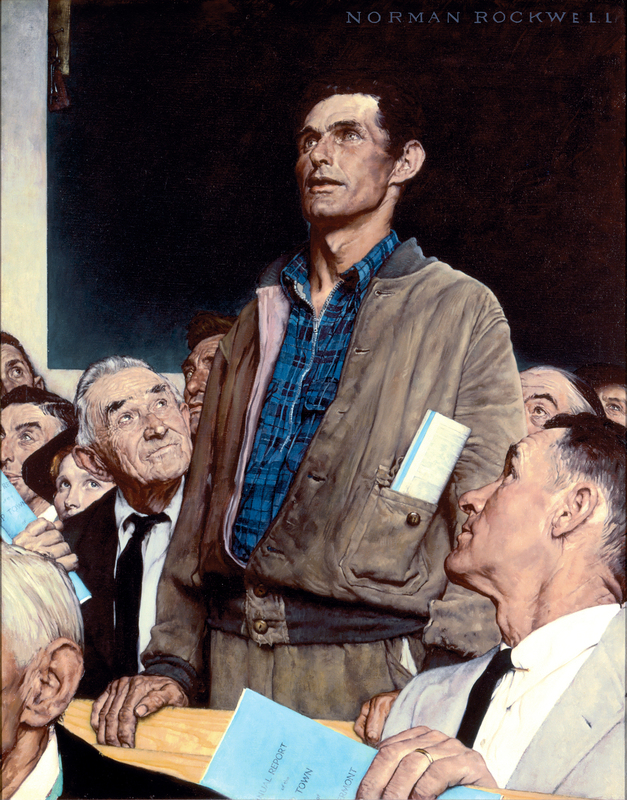 Rockwell felt this scene embodied the democratic process and was a perfect way to capture the meaning of free speech. A printed or digital copy of “Freedom of Speech” [insert link to images]. Freedom of Speech, Norman Rockwell. 1943. What is the first thing that catches your attention in this painting? What do you notice about the man standing up? How does he appear different from the men on either side of him? Who else is in attendance? You might point out the two women at the meeting. Mention, this was painted in 1943. Ask: If this had been painted 25 years earlier would women be at this meeting? Why not? Now ask students, who do we not see in this painting? What are some reasons there might not be any minorities in this room? Begin a class investigation of 20th century voting rights in the United States. You might explain, The United States Constitution did not originally define who was eligible to vote, allowing each state to decide who was eligible. In the early history of the U.S., most states allowed only white male adult property owners to vote. Ask, how and when did others get the right to vote? Native American Suffrage Act of 1924. Have students present their findings in the form of an essay, poster, blog or video. Now have students paint a new picture of the town hall meeting, this time showing a room that depicts the voting rights of today. Ask, are people still missing from this scene? Who is missing? Form your own town hall within the classroom. To begin, choose an issue that is important to students. For example, you might choose the issue of whether or not the school should have a dress code. Discuss it and debate it, then vote on it. Ask students to reflect upon the process. Now take voting rights away from a handful of students. You might decide that anyone wearing a green shirt has lost the right to vote. They can stay in the room but they may not speak or vote. Choose an issue that students are passionate about and repeat the process above. When you are done, ask the students who were left out to share how it felt to have no voice in the conversation or in the vote. Have students create a play, song, movie or essay that depicts their feelings about their right to have a voice. Ask, students to reflect upon what image they would choose to show freedom of speech. Ask, how was Rockwell’s image effective or not effective? How would your painting be similar to or different from Rockwell’s painting?